We are holding our summer Drawing at www.appalachianprospectors.com. We have 3 prizes to give away and they are: 1. A Keene A52 Sluicebox 2. 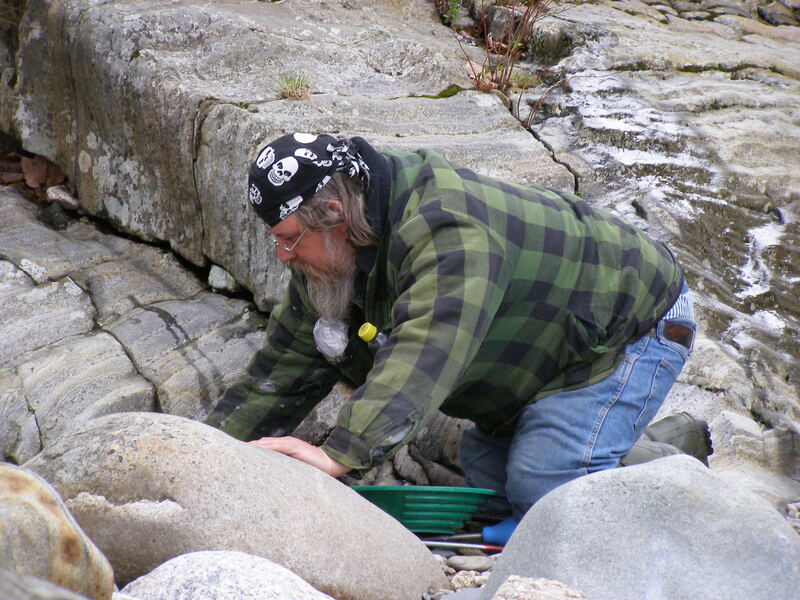 A Gold Panning Starter Kit By Garrett 3. A Book: Gold Mining In The 21st Century by Dave McCracken. To enter all you have to do is join our forum and post something about your own prospecting adventures and you must have a mailing address within the Continental United States. We will only ship prizes within the Continental United States. The drawing will be held on September 15th. It cost nothing to enter, so come and enter and good luck. 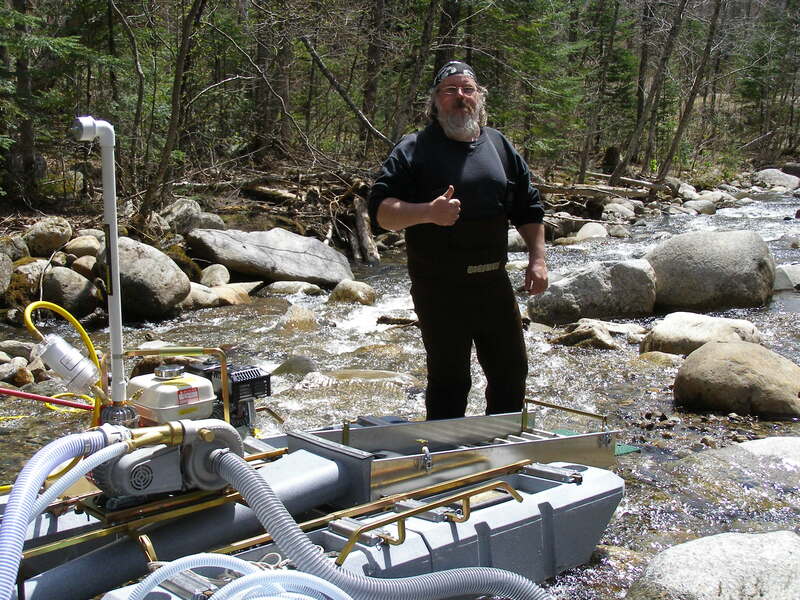 While gold prospecting you often face multiple challenges, that’s ok. Don’t be discouraged, you just have to learn how to adapt and overcome. Mother nature seems to throw you a curve ball as much as possible. It seems as though every time Hillbilly John and I are in Maine together it rains, it rains a lot. Last September we were on the river a week after hurricane Irene when tropical storm Lee hit. It was late in the afternoon, we had been dredging all day when the sky took a very ominous turn for the worse. The sky turned very dark, the clouds were moving very fast, it looked like tornado weather. The wind picked up, the sky opened up and it started to pour, hail was coming down. Thunder and lightning and we had no cover, we headed for the tree line and got as close to the ground as possible, I hunkered down by a big old log, a tree that had fallen in some past storm. We had been hit by residual lightning before and we sure didn’t want to make it a second time. It was raining so hard we could see the river rising right before our eyes. I don’t know how long it lasted but it seemed like forever. The storm finally subsided but the river continued to rise from all the run off from the mountains, and now the dredge was in danger of being washed away, we had to rescue it. We got it ashore and we drug it pretty far up the bank, we didn’t want it to wash away over night. We did a clean out and headed back to camp. We cleaned our concentrates and discovered that it was one of the best holes we had been in to date. It had rained off and on throughout the night upon our return to our work site we found the river was raging and we could no longer get into our hole. We had to move up river a little bit behind a large boulder that gave us protection from the current. It was no easy task getting it over there either. We had to float the dredge through the rapids and upon doing so we almost swamped the dredge; I had lost my footing and fell and the dredge started going sideways but we managed to get it through. For the rest of our time there it had rained, so much so that the air compressor was sucking in rain water and pushing water down to me and cutting off all air flow. That makes it really hard to breath under water. We had to keep stopping to drain the water out of everything all the lines, filter, every thing. When we got off the river that evening we rode into town about 17 miles away and gave a visit to the local Wal-Mart and bought an umbrella and some zip ties. The next day we strapped that umbrella to the snorkel of the air compressor to keep the water out. 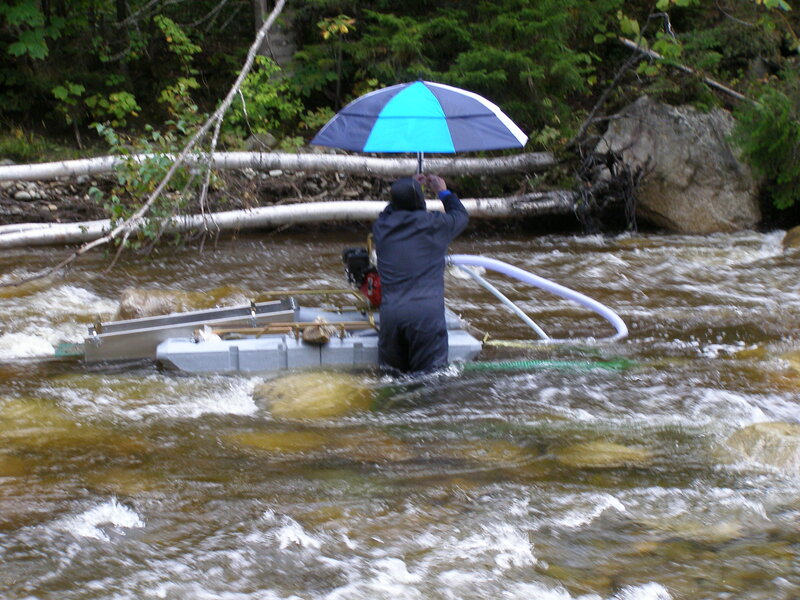 It worked with one problem, and that was it trapped the exhaust fumes and poor old Hillbilly just about passed out while tending the dredge but the thing is we didn’t get discouraged and we kept on going, we weren’t going to let mother nature stop us and we went home with gold. Another time we had been up there in May, the river was cold and out of the 12 days we were there we had 1 sunny day. On the warmer days the river would rise a little bit due to the snow melt run off from the mountains. We could only stay in the water for about an hour at a time, the water was so cold but we pressed on any way. Ppsychologically we had to overcome this one because as soon as you hit the water our bodies were saying get out. It took a few minutes to adapt to the temperature. I really had to force my self to stay in as long as possible so I focused on the gold and not the cold. That wasn’t the only obstacle to overcome when we first got there we found a good location to set up but it would be a little tricky getting to it. There was a section about 10 feet wide that was all mud and we couldn’t go around so we had to cross right through the middle of it, some spots were knee-deep and we had to carry our equipment through that. We threw down some logs to make it passable. While traversing this mud hole Hillbilly John was carrying the motor for the dredge when he slip off the log and fell knee-deep in the mud and popped his knee, which bothered him for a while but it didn’t stop him, the motor was fine. We had gotten everything to our work site, got the dredge assembled and by the way the dredge was brand new out of the box. We had test ran it back home for about an hour and it ran fine. At our work site we started it up and the belt to the air compressor was squealing, we shut it down and tightened the belt. We started it back up and it seemed fine but it wasn’t long before it was squealing again. We couldn’t pump air. I had brought a snorkel with me just in case. I used that and it was fine because it wasn’t deep enough yet to need the compressor. That night we brought the motor back to camp with us and tightened the belt. We thought that would do it, the next morning we were back on our work site, fired up the dredge and the air worked for a little while and then the squealing started again, no air. We stopped and took the guard off the belt with the tools we had brought with us and the belt seemed tight enough. So why was it not working, we removed the belt and discovered that the pulleys were spinning on the shafts. We noticed that the set screw on the pulley to the compressor had backed out and the set screw on the motor was gone. We left the belt off and we continued to dredge, I used my snorkel, we knocked off about 3 o’clock so that we could go and find a hardware store. We found one and it was almost closing time but lucky for us we made it just in the nick of time. We found the set screws we needed and we bought some other hardware that we thought we may need, screws and such and it was a good thing because we used most of them. Got back to camp that night made the necessary repairs and we were ready. The next morning we got set up, fired up the dredge and no more issues with that. It’s a good idea to bring a small set of tools with you, screw driver, pliers, combination wrench set, adjustable wrench and maybe a socket set which we had with us. If you get a new piece of equipment make sure every thing is tight. The only sunny day we had and the dredge was running like a champ. That wasn’t the only hurdle, the weather was against us from the start like I said out of 12 days only 1 was a sunny day the rest of the time it was overcast and it rained off and on. On about our 8th day it rained hard for about 27 hours straight without letting up, We couldn’t get dry, the tent was leaking and it was hard to get warm. We put on some rain gear, a poncho, and we decided to do some crevicing and panning in another location close to camp instead. We had seen the river rising tremendously so we went to check on the dredge. It was ok but we had to pull it out of the water. We just panned for the rest of our stay, we don’t quit, we just adapt and change our method and we came home with gold. The river had gotten to high to dredge in. Hillbilly John doing some crevicing. 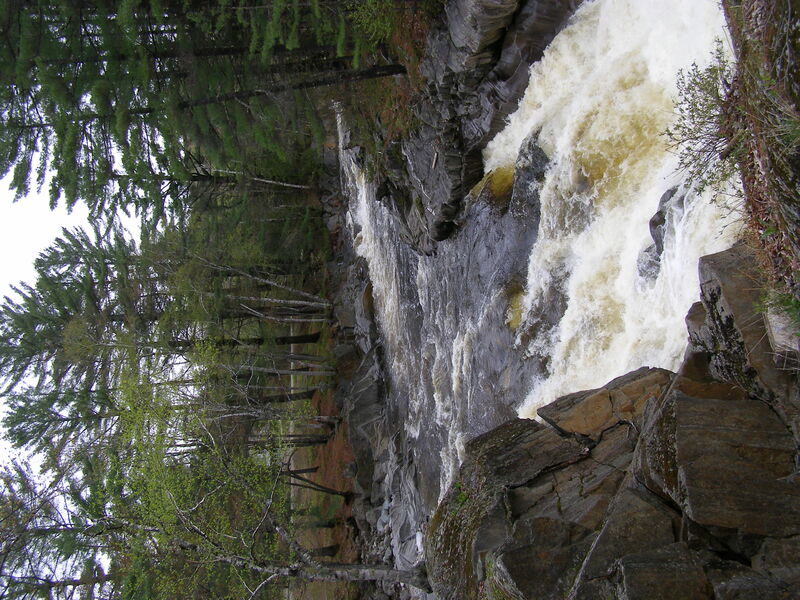 Just recently my wife, son and I were up on the East Branch of the Swift River. I brought my two and a half-inch dredge so that I could do some test dredging in another location. I packed everything into the spot, set everything up and noticed that I hadn’t shut the gas off the last time I had used it.I figured that’s ok I have done that before, it starts every time. I pulled the cord on the motor and nothing, pulled it again and again, nothing. I drained the float bowl and tried again, nothing, not even a pop. Made sure I had spark and I did. Got out my tool kit and removed the carburetorand took it apart and cleaned it the best I could, also took off the gas line and cleaned the screen that was in the line, put it all back together pulled the cord and at least this time it popped but did not start. I needed some carb cleaner so I broke everything down and packed it out to the Jeep, we had to make a trip into town and go to Wal-Mart. By this time it was getting to be late afternoon. I got a can of Gumout and when I was leaving Wal-Mart the sky was getting dark and of course while driving back to the campground it had started raining. Got back to the campsite and I tried to wait the storm out but I couldn’t wait, I put the motor on the picnic table, rain, thunder and lightning, I got to work, I was there to dredge and that is what I planned to do. I removed the carburetor again took it apart and sprayed it all down good, put it all back together pulled the cord and it fired right up. I couldn’t wait to hit the river the next day, I was relieved. The next morning I had packed everything in to my spot got everything set up again pulled the cord and it fired right up, excellent, but now it will not take a suction, I tried for about a half hour or so and I was discouraged, I cussed a blue streak in the sky and shut it down. I sat back for a few moments to cool down and thought I have to be sucking air from some where. I checked all of my connections, I had teflon taped them all to make sure I had no leaks and then made sure the flap was working properly on the suction intake of my hose and it was. I fired it back up, still no suction, I was about to give up when I thought check around the gasket of the pump for air leaks so I did and guess what it was leaking. I started splashing water on the gasket to make it swell, it is made of cork and while it was in storage it had dried and shrunk. It worked, it took a suction immediately. I was dredging and I had accomplished what I had come to do, I didn’t give up I overcame the situation.